Super Mario cakes? Doom jello sculptures? No edible homage to video games would be surprising unless the edible homage was... healthy? 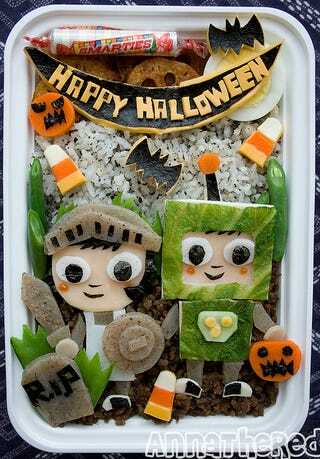 One inspired cook made a dish of Costume Quest for her boyfriend to eat and for us to admire. The source material is the recently-released downloadable Xbox 360 and PlayStation 3 Halloween role-playing game Costume Quest from Double Fine Productions. The cook is "Anna the Red," who blogs about bento boxes and other cool things she creates. One of the twins, Reynold, has a blue robot costume on, but as I said in my blog before, it's almost impossible to create blue from a natural ingredient, so I had to change it to green. I first made the base of his costume with turkey, then microwaved a leaf of lettuce, trimmed it to fit the turkey and put it on. For the chest plate I sliced a broccoli stem, cut out cheese with a straw and put it on the chest plate. Read the full recipe at Anna's site.